The title of Aonghas Pàdraig’s first full-length novel means ‘The Night Before We Sailed’. Few novels have been published in Scottish Gaelic and many of those that have are aimed at children and school pupils. This makes the author’s achievement in this ambitious and outward looking novel even more startling. It is thrilling to experience a book like this in Gaelic. 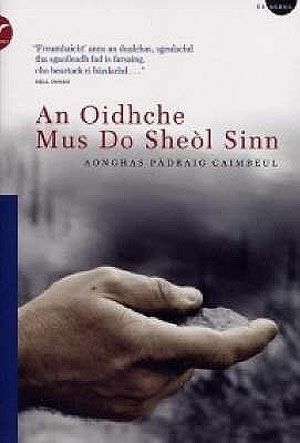 An Oidhche Mus Do Sheòl Sinn is a joy to read, moving and beautifully written. The novel was shortlisted for the Saltire Book of the Year Award in 2004 and came second in that year’s BBC’s Taghadh nan Leabhar, in which the audience voted for their favourite Gaelic book. It follows the lives of a South Uist family separated by war, geography and political commitment through the 20th century. Alasdair is decorated for his service during World War I and settles in England where he has no contact with his family until one of his sisters arrives on his doorstep. Màiri rides south to join the International Brigade and fight against fascism in the Spanish Civil War. Eòin’s vocation to the priesthood takes him first to Aberdeen and then to Spain before bringing him back to Uist where he must re-examine what he has learned in the light of growing uncertainty. The novel is itself an act of piety. Its broad scope connects the present to the past, the Islands to Europe and the wider world. Its language is rich with the Gaelic of Uist, with new words and old stories, with the knowledge that inventiveness might be the best service one can do to any tradition. Gaelic fiction in the 21st century could not have got off to a better start.